To trash Bush was to belong. There was little upside in supporting Bush, even if you had supported his agenda. There is a lot to deal with: the economy, environment and the world. Now starts the hard part: getting the job done…. From the day President Bush took office, the long knives were out for him — in ways they will not (and should not) be out for President-elect Barack Obama. The chattering class saw Dubya as a walking style crime in a cowboy suit. 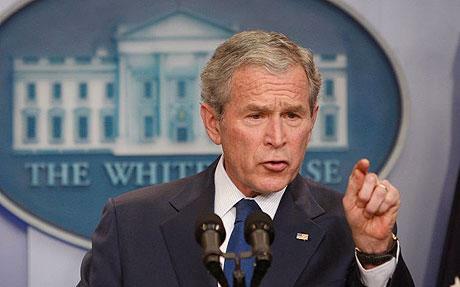 They hit Bush for everything — for the way he mangled syntax, for the books he read and because he worked out too much. Note that now that the buff Obama is taking office, stories gushing about Obama’s daily workouts flood the channels. Oh, yes, and the same people who belittled Bush for sending troops to war even though he only served in the National Guard somehow do not seem to notice Obama’s utter lack of military experience. Most of the Democratic candidates for president in 2004 and 2008 voted for the Patriot Act — and then campaigned …. “I think he’s a good president,” I told her, which seemed to dumbfound her, and wreck my chances of appearing on her show. In the avalanche of abuse and ridicule that we are witnessing in the media assessments of President Bush’s legacy, there are factors that need to be borne in mind if we are to come to a judgment that is not warped by the kind of partisan hysteria that has characterised this issue on both sides of the Atlantic. 24-hour news cycle, will probably hand down a far more positive judgment on Mr Bush’s presidency than the immediate, knee-jerk loathing of the American and European elites. At the time of 9/11, which will forever rightly be regarded as the defining moment of the presidency, history will look in vain for anyone predicting that the Americans murdered that day would be the very last ones to die at the hands of Islamic fundamentalist terrorists in the US from that day to this. The decisions taken by Mr Bush in the immediate aftermath of that ghastly moment will be pored over by historians for the rest of our lifetimes. One thing they will doubtless conclude is that the measures he took to lock down America’s borders, scrutinise travellers to and from the United States, eavesdrop upon terrorist suspects, work closely with international intelligence agencies and take the war to the enemy has foiled dozens, perhaps scores of would-be murderous attacks on America. There are Americans alive today who would not be if it had not been for the passing of the Patriot Act. There are 3,000 people who would have died in the August 2005 airline conspiracy if it had not been for the superb inter-agency co-operation demanded by Bush after 9/11. You are currently browsing the archives for the Patriot Act category.